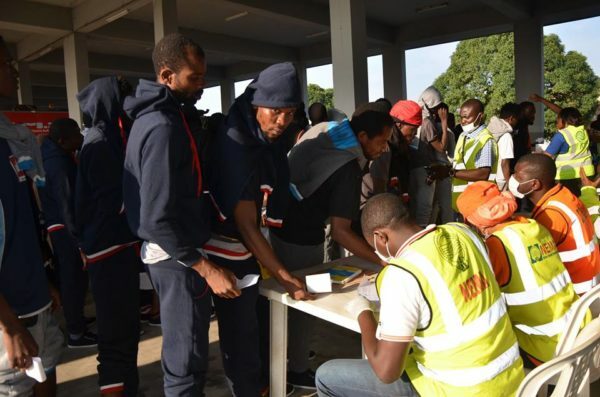 More Nigerians have returned from Libya where they traveled to in an attempt to cross the Mediterranean Sea over to Europe. Speaking to CNBC Africa‘s Damilola Ade-Odiachi, the returnees shared their ordeal, saying they were kidnapped and maltreated before they were deported to Nigeria. Adelo Jerry told CNBC Africa he had to leave Nigeria after he graduated from Auchi Polytechnic in 2013 and could not find gainful employment. “I thought it wise to travel so that as a young Nigerian I can raise a better family for myself and to live a better life there in Europe,” he said. He revealed that his journey from Nigeria on the 1st of November to the seaside in Libya on the 10th cost him an estimated N970,000. “I was kidnapped and held hostage. I had to call my parents with pressure to tell them their son had been kidnapped,” he continued. The amount of money you spend giving those people- paying N 550,000, one point something million, 1.5 million to these so called people who are going to help you start a better life. If you use it and start a pure water business, or even a bukka you’d be smiling all the way to the bank. Maybe not initially, but eventually.